The month of May each year celebrates Nurses Week and Oncology Nurses Month. With winter past us, the anticipation of summer – celebrations of graduations and new beginnings – brings a moment of reflection on the blessings and path thus far of my oncology nursing career. As I write this, I realize there has been a bit of serendipity, hard work, and a legacy to carry forward. Growing up, I wanted to be a pediatrician like my great aunt, Eleanor Aurand, MD, a graduate of University of Pennsylvania School of Medicine in 1951 (as one of 2 women in her class!). She was the matriarch of our family and well known in her community. I appreciated the example she set for me and wanted to live up to her legacy. Late in college, I decided to pursue a nursing career after working as a nursing assistant. I enjoyed the bedside care and relationships I built with my patients. 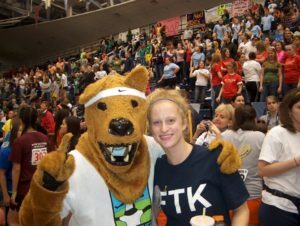 I also saw the impact cancer had on patients and families through my involvement in the Penn State Dance Marathon, a student run fundraising effort to support pediatric cancer at Penn State Children’s Hospital. Oncology always struck a chord with me, though at this point I still didn’t realize where my journey would take me, even though my family had also been affected by cancer throughout my youth and college years. So with a quick pivot, upon graduation from Penn State with a biology degree, I immediately started a second degree nursing program at Thomas Jefferson University and graduated with a BSN one year later. A bit of good timing and serendipity allowed me to secure my first nursing job on an inpatient oncology unit at Jefferson. It was here that I had peers and mentors to teach and model what it means to be an oncology nurse. I faced life and death with patients, celebrated special occasions and supported them through devastating news, tough treatments, and also shared success. One memorable day I took down a young father’s chemo for the last time- he had completed treatment and would do well. We celebrated! I left his room and walked across the hall to find my other patient in tears, a mother with young adult children, who had just been told her cancer came back and there were no more options. We cried. Talk about the spectrum of emotions you can have in 10 minutes, yet that is the essence of oncology nursing: being present and compassionate to our patients’ experience no matter where they are. I am part of a scary, uncertain time in someone’s life, but it’s in these moments that we can show our humanity. I gain perspective from this profession and my patients. I cherish these relationships with patients, families and colleagues. Fast forward though a master’s degree in nursing and an amazing opportunity to join the team at Penn Medicine as an Oncology Nurse Navigator. In 2012, this program was being developed to help facilitate access and coordination, and to provide an extra layer of support to patients, families and our disease teams. Over the past 6 years, I’ve had the opportunity to navigate patients with all types of cancer, with my current specialty focusing on patients with brain and spinal tumors. When patients call or are referred, I first do a nursing assessment and apply disease specific (and operational/logistical) knowledge to identify and resolve their needs, such as triaging them to the appropriate provider and appointment, facilitating communication, or making referrals to supportive services. Our support and interventions are personalized to the needs of patients and families depending on the diagnosis, treatment plan and other identified barriers. The problem solving, clinical, and therapeutic skills I’ve developed as a nurse navigator have been built upon my early years in patient care. It is a priority for me to establish trust and reliability with my patients and families in this uncertain, terrifying and vulnerable time, as well as with colleagues. Many times, patients trust me to talk candidly about how to make health care decisions, weigh treatment options or how to plan for the future. As a nurse navigator, I may be the first person that a patient talks to after they are diagnosed with cancer (or before they even know, but they know they need help). Or I can be a resource as patients are transition between surgery and chemotherapy or radiation and other decisions. The more trust I can establish and relationships that I have, the better I can collaborate and advocate for my patients and families. Oncology nursing is the most humbling, meaningful, and rewarding specialty I could ever imagine to work in. I have the privilege to support and care for patients and families in order to ease the burden of a cancer diagnosis. They teach me every day lessons in grace, perspective and being present. What really matters? Being an oncology nurse means I am part of something bigger than myself: a community of caring, passionate, and committed nurses and other health care professionals who bear witness and show humanity to patients and families every day. Notably my Aunt Eleanor was also a nurse first- graduating from Lewistown Hospital School of Nursing in 1944. I think she’d be proud of her legacy; her namesake practicing oncology nursing at her Alma Mater, Penn Medicine. Eleanor Miller, MSN RN OCN, is an Oncology Nurse Navigator at The Abramson Cancer Center at Penn Medicine. She currently works with patients with brain and spinal tumors and their families. Learn more about oncology nurse navigation from the Academy of Nurse and Patient Navigators. This entry was posted in Homepage, My Oncology Career Path, OncoLink News and tagged cancer nursing, careers, Nurse navigator. Bookmark the permalink.